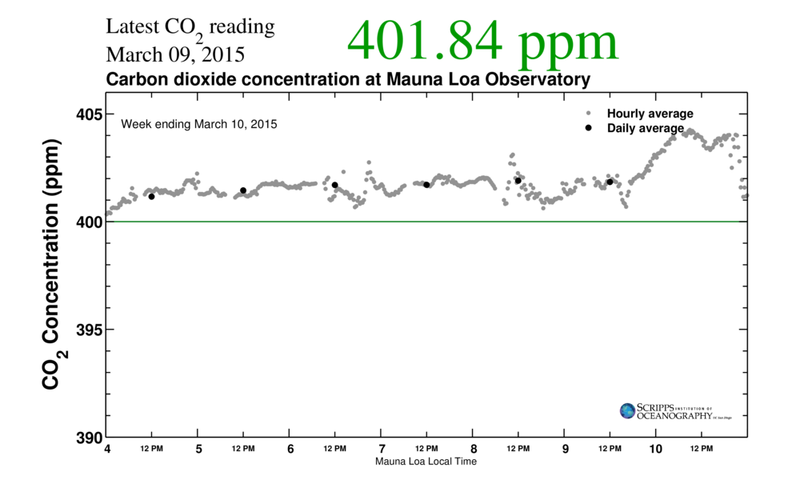 Apocalypse 4 Real: Mauna Loa CO2 Spikes to 403.43 ppm - Ocean Heating Driving the Increase? Mauna Loa CO2 Spikes to 403.43 ppm - Ocean Heating Driving the Increase? 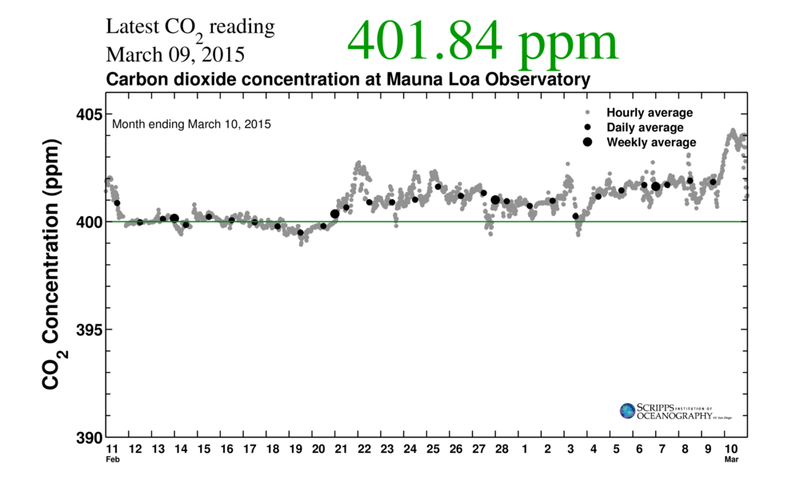 On March 10, 2015 the Mauna Loa NOAA/ESRL CO2 concentration reading spiked from 401.56 ppm on the 9th to 403.43 ppm on the 10th. This jump is almost a 2 ppm change in one day, an unusual event. Usually, these readings are considered anomalies that last for one day, and are deemed as local fluxes that do not represent the general readings of the Central Pacific. This is briefly detailed in the NOAA ESRL reported readings below. This seems supported by the hourly tracking by the Scripps Mauna Loa CO2 readings graph for March 10, 2015, even though Scripps did not report a daily average the readings were too variable. What is interesting is that the Scripps graph below reveals hourly readings over 404 ppm, before tapering off to near 401 ppm at the end of the 10th. It will be interesting to see if the readings stay in the 401 range - and for how long into the near future. The Scripps month long chart reveals significant variability for February 9 to March 10, with abrupt shifts that made it a challenge for Scripps and NOAA to determine a daily CO2 average on some dates. Perhaps Scripps will issue a reading for March 10th later this week. However, is the assumed variability really a local source? I suggest it really is a natural event in the Central Pacific region, based upon air mass boundaries. The METOP IASI 1-B global mean CO2 for March 10 reveals the global and regional variability. The image below depicts a global mean of 404 ppm at 972 mb. However, of the Northern Hemisphere has concentrations above 410 ppm. The detail around Hawaii shows concentrations in some grid cells above 410 ppm. As noted in a post on behalf of Ralph Keeting on the Scripps blog, the frontal boundary, represented here in the grey (cloudiness blocks METOP IASI CO2 readings) can separate cooler northern hemisphere air with higher CO2 concentrations from warmer tropical air with lower concentrations. That may be the case illustrated below. This is the detail of the 972 mb image for the Hawaiian area. Time will tell how long this spike lasts, but it is very likely, given the impact of El Nino, and general ocean warming of the Pacific, that we perhaps will see concentrations above 405 ppm and some daily readings above 406 in May or June.